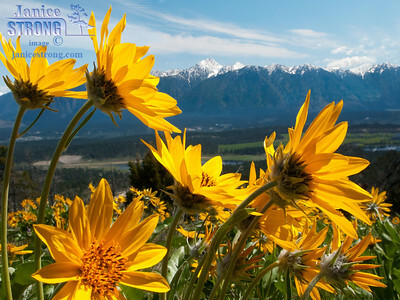 Fisher Peak is the prominent summit of the BC Rockies. 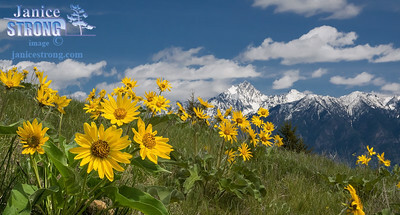 1618-1619 Mount Fisher and Balsamroot Flowers. 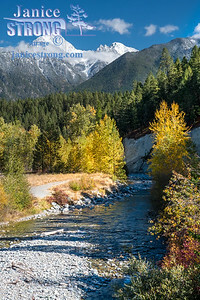 Bright yellow Balsamroots Eager HIlls in the Cranbrook Community Forest. Wycliffe in winter has some snow on the grassland. 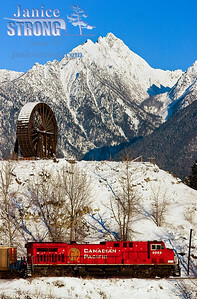 In winter a new Canadain Paciifc Railway engine on the tracks runs below Fort Steele Heritage Towne's historic waterwheel on display. 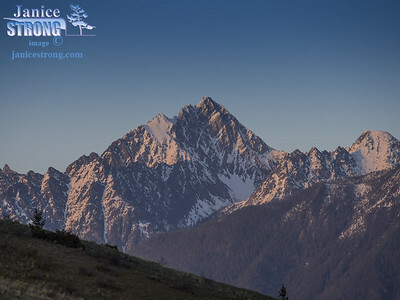 Fisher Peak rises above the scene. 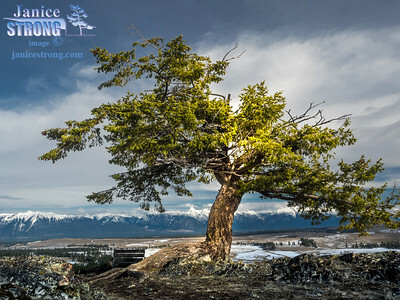 This image was taken from Eager Hills in the Cranbrook Community Forest. 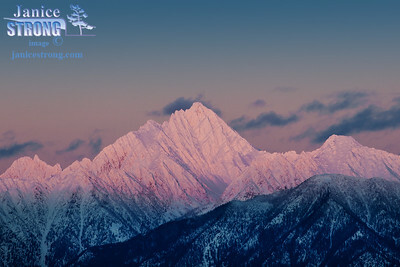 It was almost dark in mid-winter with a sunset alpenglow touched the Rockies with a pink light. 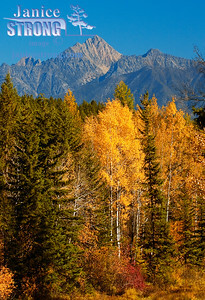 Autumn colours of yellow and red brighten the foreground of Fisher Peak, near Jim Smith Lake. 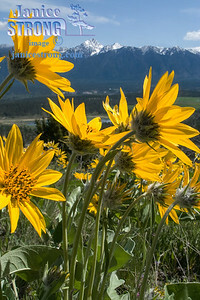 Bright yellow Balsamroots are often called Sunflowers, Eager HIlls in the Cranbrook Community Forest. 3724-Fisher-Wycliffe and soft evening light in late winter. 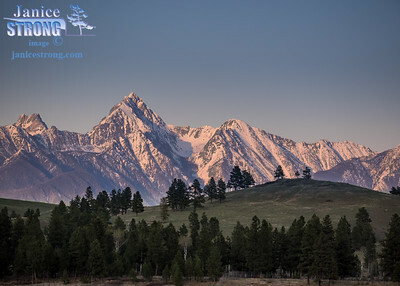 This image shows the Wycliffe prairie during dusk with Fisher Peak of the BC Rockies in the background. 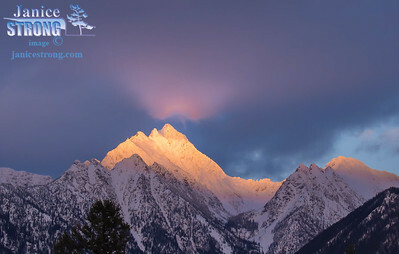 Pinky/purple light on the snow covered Rocky Mountain top of Fisher Peak in early spring seen from Wycliffe. 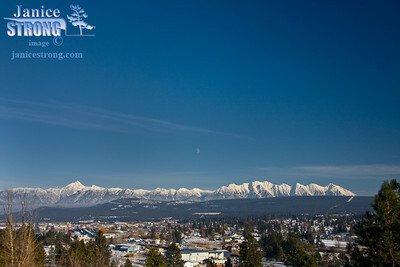 The City of Cranbrook BC in winter with the Rocky Mountains on the skyline, showing Fisher Peak and the Steeples Range. 9822-9823 Fisher Cranbrook Downtown Light Strip. Storm Clouds hugged the western sky at sunset. 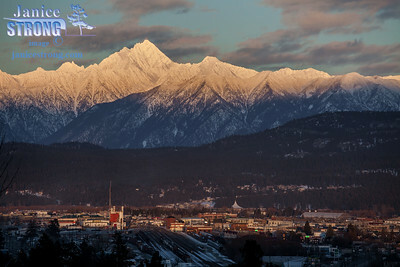 Until an opening in the clouds showed this fabulous strip of light hitting the downtown part of Cranbrook, BC. 9842 Fisher Peak Crop Alpenglow . 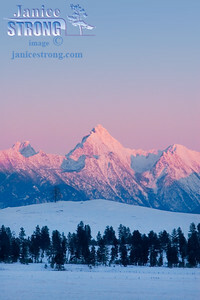 Pink winter sunset light on the Rockies. 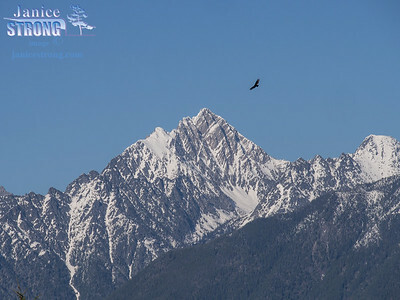 Raptor soars in the updrafts of the massive mountains above the Rocky Mountain Trench near Cranbrook and Fort Steele. 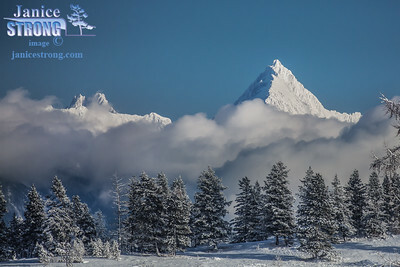 The summit is Fisher Peak of the BC Rockies. 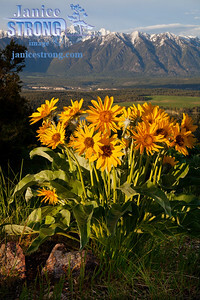 Balsamroots flowers at sunset seen from Eager Hills in the Cranbrook Community Forest during May. 9490 Fisher Peak and Moon. 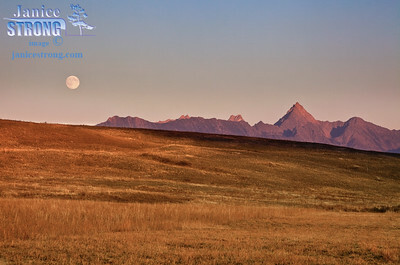 Grasslands in Wycliffe, BC at sunset with the rising full moon and Fisher Peak. 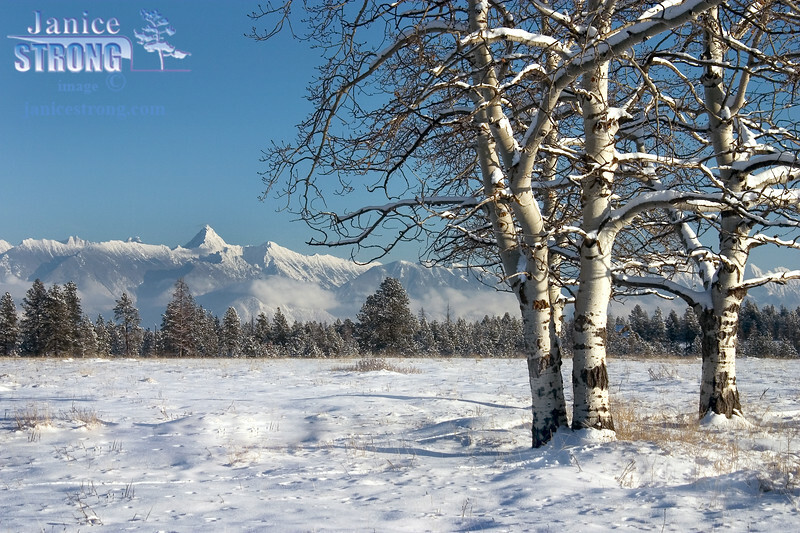 This image would make a dynamic enlargement to about 6 feet wide or more. 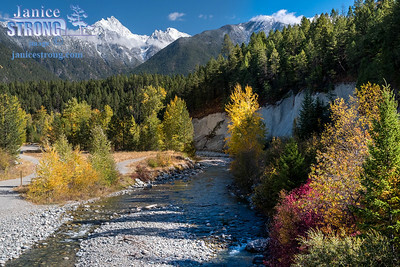 Fisher Peak and Steeples Range of the BC Rocky Mountains. Fisher Steeples Moon Panorama Flat Dry Brush. 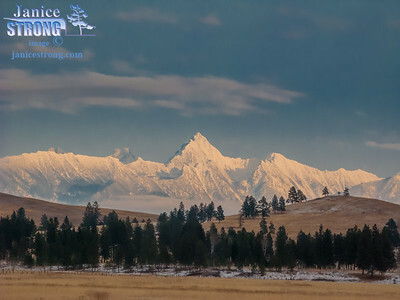 Fisher Peak and the Steeples Range of the BC Rockies form a magnificent skyline when seen from the Rocky Mountain Trench near Wycliffe, British Columbia. Tree with a highlight strip shining right on the trunk of this unique fir tree. 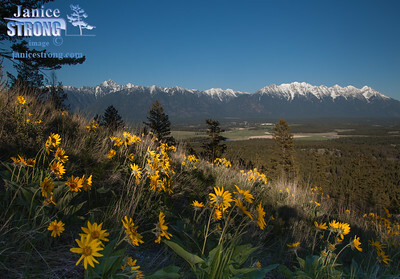 Eager Hills in the Cranbrook Community Forest hosts a fine display of Balsamroot Flowers in early May. 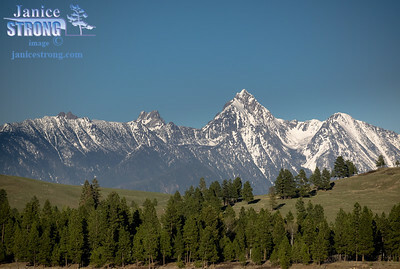 Snow still holds to the highest summits of the Rocky Mountains with Fisher Peak being the most prominent around southeastern BC near Cranbrook. 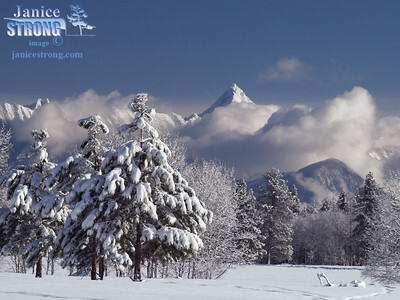 Swirling clouds after a snow storm expose the peaks of the Rocky Mountains- Fisher Peak. 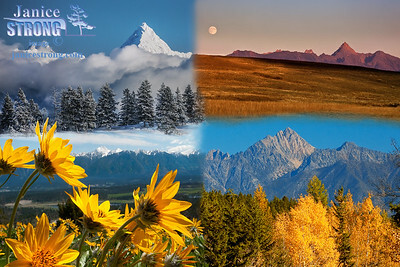 Capturing the 4 seasons of Fisher Peak of the BC Rockies, in southeastern BC.